When I was a young man, I was one of the best paddle ball players on Beit Yannai beach. One day, I decided to try my luck and talent on the tennis court. In the first lesson, our coach taught his young student how to hold the tennis racket and asked us to do precisely as he did. The obedient trainees did exactly as he said. I, on the other hand, based on my successes in paddle ball, held the racket the way I was used to holding it. When the coach tried to correct and train me, I responded arrogantly. When I wanted to start playing, he told me, “You are behind. Until you get rid of your paddle ball habits, you won’t be able to play tennis properly.” I felt that the coach was denying my creativity, and I didn’t have the patience necessary to learn the basics of the game. I left the tennis court and went back to the beach. It was only many years later that I understood what the coach was trying to teach me: a player without basic skills will have to invest thought and energy in every single move. A unique or creative style can develop only after control over the basic movements has been mastered. Quite rightly, today’s world of product development views innovation and creativity as necessary for survival. Many of the people involved in development think of enforcement of standardized regulations as little more than putting the brakes on the wheels of development. What is the connection, they ask, between creative brilliance and standardized processes rooted in inflexible development protocols? Why should we enforce standards when we are trying to create an agile organization? Why should we force ourselves to solve problems within the clumsy A3 format instead of simply solving the problem? These are not frivolous questions. In the world of manufacturing, time is a precious resource, and the tremendous pressure to get results often leaves little time for developing skills that don’t lead to guaranteed rapid improvements. It’s easy to understand the entrepreneurs who zealously defend the fragile flame of a dream that they have managed to ignite: Caught between the winds of the competitive market and the stagnation of organizational awkwardness, they are afraid that the light might be extinguished. The first answer is that organizational standards, such as using the A3 framework that we described in our previous column, “From Firefighters to story Tellers” , are intended to improve the organization’s achievements and performance; they have no other goal. These techniques were developed by Toyota during the most difficult times and in an unprecedentedly competitive market. Necessity, is after all, the father of invention. True, in the short run, these tools require investment of time an effort in order to learn how to use them and make them part of the work routine. But once you are proficient in filling out an A3, the problem-solving is so much better in terms of quality, speed and thoroughness than when you just use trial and error. The A3 format is based on the principle that you should “think before you act,” and that the initial investment – the delay in solving the problem – promises greater returns with regard to problem-solving and the depth of organizational learning. In a Lean enterprise culture, the permanent principles, standards are interwoven with the forces of change, and it is not possible to forgo the tension between that which is permanent and that which is changing; regular tasks that repeat themselves over time become artefacts that are automatically put in place, much like an automatic pilot, and thus a single standard and language are created. The standard, which is the result of the accumulation of personal or organizational knowledge and experience at a given time, provides the basis for change in the future and serves as a crucial step in the climb along the ladder of creativity. It is a necessary condition for effective innovation. Over these three stages of the journey, the learner (whether an individual or a team) must progress from the Shu, where he precisely copies his teacher’s instructions. It is only after he has learned the basic movements and proved his professional mastery in the current system can he move on to the Ha, which includes the development of new ideas, that expand out from the existing norm or standard (which points to the advantage of humans over robots). Only after he has (empirically) proven the advantages of his innovations does he reach the stage of Ri, in which the learner is now known as an expert-master. 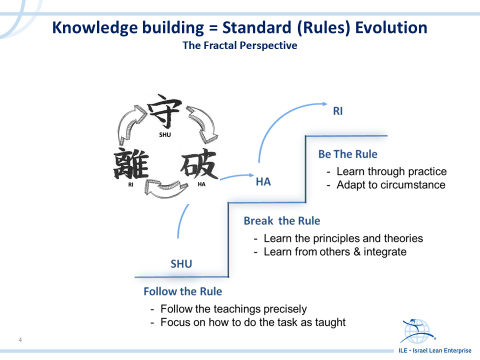 In the culture of a Lean enterprise (and in any learning organization), the principle of Shu-Ha-Ri is evident across a wide variety of skills: at the level of the individual, the team, or the entire organizational culture that enables a new member to quickly integrate into the framework of existing standards. The three stages of training are the key to creating and maintaining individual, group and organizational knowledge. The individual or group learns the professional skills and earns the right to examine knew ways to change and improve only after they have proven their proficiency at existing tasks. The third stage of mastery, the Ri, is granted only to those who have empirically proven the value of their new ideas and operations. Valid and effective revolutionary processes will become the new standard, the basis for the creative ideas of the next generation of learners.